Lessons are collections of course materials—content, assignments, discussions, links, and files—that cover a particular section of the course curriculum. When a lesson is available, course alerts (found on Home > Dashboard and My Courses) take you to Course > Info, where you'll see alerts for particular lessons. Click the alert for the lesson you wish to go to. You can also navigate directly to a course's Lessons view, where all of the lessons the instructor has made available will be listed. indicates that you have completed that lesson. indicates that the lesson is available but has not been completed. indicates that the lesson is not available—whether because you must complete the previous lesson or because its availability has yet to start. 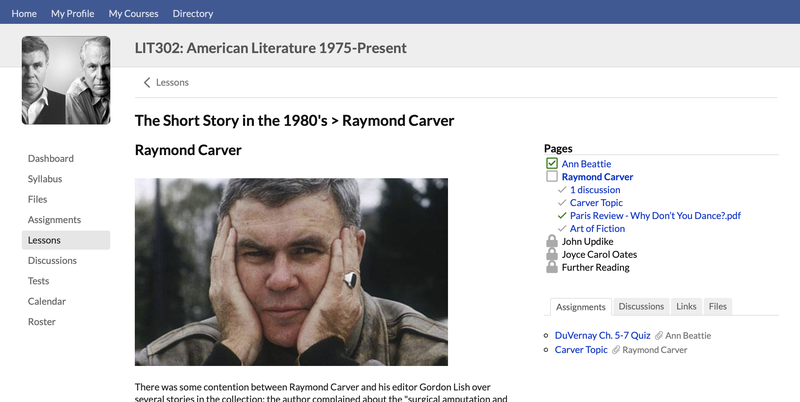 If an assignment or a discussion has been connected to a lesson, you'll see a link to the lesson on the assignment or discussion's page. It will say something like "This discussion belongs to Lesson Name." Gated lessons: As alluded to above, sometimes your instructor may require you to view or complete a lesson before you can proceed to the next one. If a lesson has required elements, you must complete those before you will be considered to have completed the lesson. Pages: Your instructor may divide the lesson into pages. Pages may let you navigate freely, or they may contain elements you are required to complete or interact with before you can proceed to the next page. Lesson content: Text, images, video, and audio that convey the meat of the lesson. Assignments: Your instructor may link the lesson to particular assignments; if the assignment is required, you'll need to submit work for it in order to proceed. Discussions: Likewise with discussions: they can be linked to the lesson, and your participation may be required in order to proceed. Links: Links take you to an external website; if required, you'll need to visit that site in order to proceed.